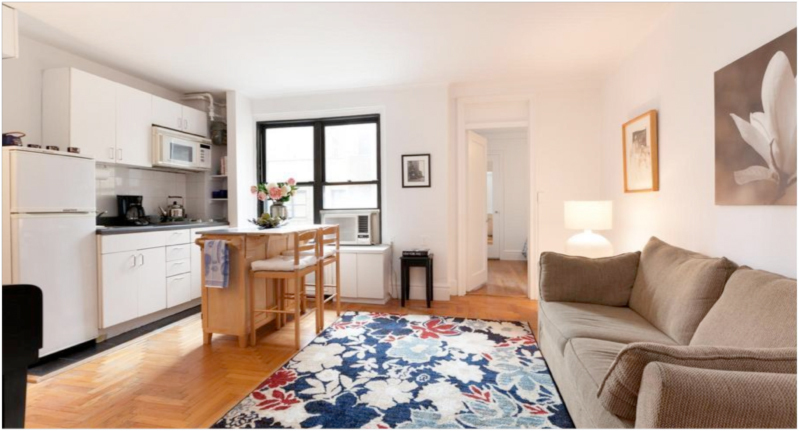 After signing my name 82 times (yes, I kept track) and a mere two months, I closed on a one-bedroom on Manhattan’s Upper West Side. The morning of the move from my tiny studio was bittersweet. That little place had become home. And despite the pouring rain, it took only two and a half hours for the movers from Golden Hands Moving to expunge my life from those 90 square feet. Seated on a couch (a couch!) in my new apartment, sunlight flooding in the multiple windows, my stuff swimming in space, I pinched myself. Sure I’ve lived in larger homes and apartments, but this time, this time it’s different. This time it’s all mine. And even though it’s only two avenues from my old studio, it feels like a world away. On the few return trips to clean up, suddenly I was sounding like the skeptics. How did I live in this teeny room? It suddenly felt way too small. I unpacked all 33 boxes that first night, enjoying every minute, even laughing out loud when I discovered yet another shelf or cubby for my belongings. At one point I called my grandparents, the two people most instrumental in putting the “Buy a place already and get out of that closet you’ve been living in” bug in my ear. It wasn’t until I hung up I remembered it was Holocaust Memorial Day, the day dedicated to the liberation of Auschwitz. Of the hundreds of well wishes I’ve received, it was from my grandparents – those two who know firsthand how dark and unhappy life can be – that meant the most. 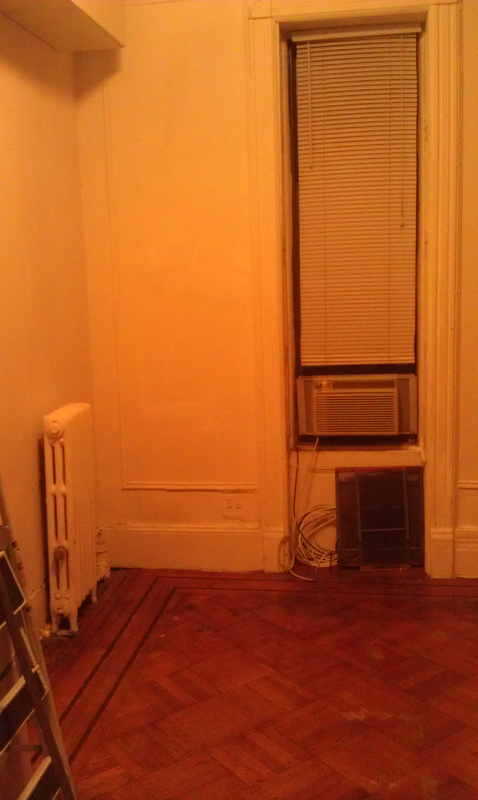 New apartment with temporary furniture...since I had none! I do not regret one minute in my 90 square foot apartment. Was there some sacrifice in it? I guess, but if anything, it has made me more appreciative of the little (no pun intended) things. Cooking a meal in a kitchen, having friends and family visit, and not having to walk five flights and a city block to do laundry – things easily taken for granted. I’m sure after a few months I may too, but for now, I will simply enjoy the enormous pleasures they bring. What a great apartment but more importantly what wonderful grandparents you have. I know you consider yourself very luck. I got a tear over the message and love that came from your grandparents. Sweet! Your new place is crisp, and yes…sunny. Enjoy! Laundry! Oh, yes, I never thought about what a pain that must have been. Although, I know alot of people have to deal with that no matter what size your apartment is. In my younger years, I remember having to walk a block to do laundry. – what a pain. Makes you appreciate the little things for sure! Looks like a lovely place to write. Mazel Tov! Congrats! It’s Beautiful – and I’ll bet the mortgage is too! Kaikkea hyvaa sinulle uudessa assunnossa. Congrats! Mazel Tov! Nachaus! Your new home is gorgeous! Welcome, neighbor. I fully appreciate the joy you must be feeling right now. You are in a wonderful place with people who would do anything for you. I know you don’t know that yet but you will. Welcome to your new home. Congratulations, iy looks beautiful! I have one question, where did you purchased your black shelf/desk that you used at your 90 sq ft apartment?